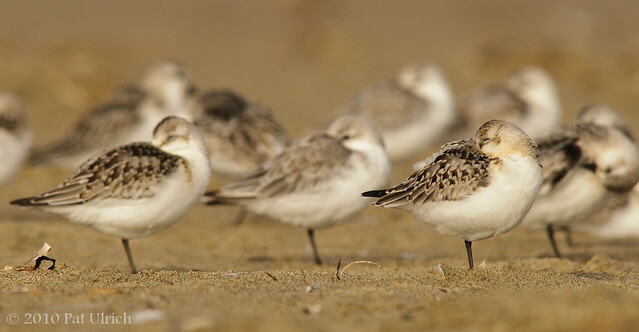 Some resting sanderlings (Calidris alba) along the beach at Limantour Spit in Point Reyes National Seashore. As a whole, this flock of mostly sanderlings was actually fairly still. For anyone who has watched sanderlings for any length of time, that's rather unusual, since they seem to be in constant motion. And this was mostly still the case -- even though the flock generally stayed in place, the individual birds kept on the move, constantly shuffling positions. These birds were resting in the middle and eventually found themselves at the edge of the group. I like this shot both because it shows a restful side of a normally speedy bird, but also because it shows slightly different stages in the change from summer plumage to winter plumage. The bird on the right still has a bit of the chestnut coloring left, while the bird in the middle is in the plain basic plumage, and the bird on the left is somewhere in between. 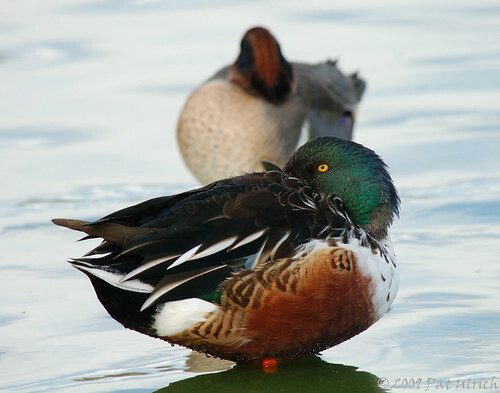 Northern shovelers are one of my favorite ducks. I think they are strikingly beautiful -- from their exaggerated bills to their subtly bright colors. In this shot, I really like how the yellow of the eye stands out from that deep green head. Taken at the Radio Road Ponds in Redwood City a few weeks back.